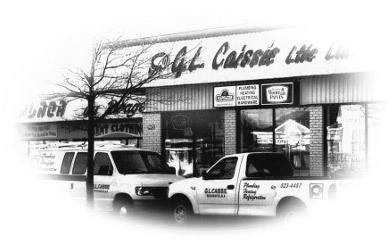 Here at GL Caissie, we combine the warmth and friendliness of the old-fashioned hardware store with the latest merchandise and service technology. We are dedicated to providing personal service for everyone who deals with our company. We are driven to help our clients find solutions to their needs. If we don’t have it, we’ll find it or make it. We’re never too busy to be friendly. Our employees are extended family members. We are committed to maintaining an environment where all staff has an opportunity to participate in building a successful small business. We will maintain the highest standards of quality and service to our customers, our staff and the community. Coming from a hard working and business oriented family. M Gérard Caissie settled in Richibucto in 1957 after doing different jobs in the construction industry. Louis Caissie (Rhéal’s grandfather) was drilling wells at the time and had a good reputation as a well-driller, but was also known for the love of playing pranks on people. Still, to this day Rhéal will often go to a customer’s house and will hear stories of old Louis à Pierre. To Gérard, setting up shop in Richibucto seemed like the right thing to do. Fifty-three years later, the family is sure glad he chose the beautiful town of Richibucto and Kent County.